A very fine bit of reportage that's the more extraordinary for drawing exclusively on materials made at the time of the events narrated -- the efforts of the Philadelphia city authorities to deal with the black liberation group MOVE in the 1970s and 1980s, culminating in the decision to bomb the members of move out of their home in 1985. The bomb started a fire that killed eleven people and burned down more than 60 houses around the MOVE property, and a great deal of the film deals with the commission that the city established in the aftermath of the tragedy to assess what had occurred. 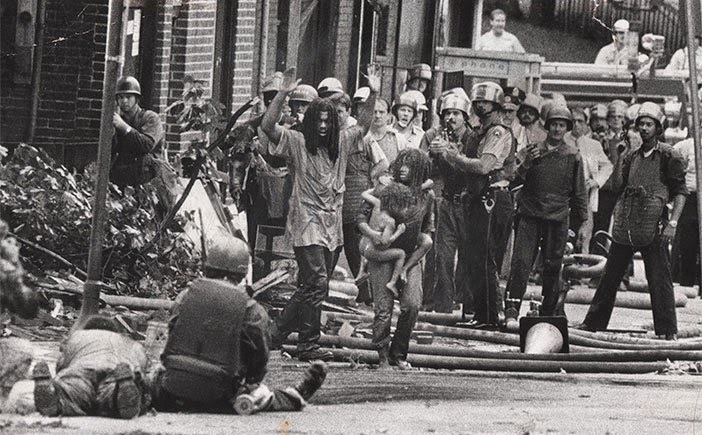 Although apparently obscure on the national scale -- I've been startled to discover how few people are familiar with even the basics of an incident where a city bombed its own residents -- the events surrounding the gathering confrontation MOVE were exceptionally well documented by Philadelphia media at the time. Osder does a fine job of stitching together footage of legal depositions, commission testimony, and news footage from both 1985 and earlier confrontations with MOVE (particularly a 1978 incident in which a police officer was killed) into a compelling narrative. While the city authorities are clearly in the cross-hairs, Osder makes no attempt to portray MOVE as an especially sympathetic bunch: having these folks as neighbours was a constant headache (sometimes literally, as they liked to berate people using loudspeakers), but the film poses profound questions about our ability to tolerate difference, and ultimately about our ability to recognize a common humanity. There is but a single instance where someone from one side of the conflict appears capable, as the confrontation spiralled, of making that connection; as a member of the commission noted at the time, it's something of a beacon of hope though ultimately so unusual that it looks more like the exception that proves the rule.